From between Perth and Geraldton on the south west of Western Australia, Verticordia muelleriana is another outstanding example of the genus. Brilliant pink to red flowers in spring and attractive foliage make it a great garden plant. The foliage is a mid green, small and rounded, and held closely to the stems. Although a number of Verticordias have been cultivated over the last 100 years, they are often regarded as ‘difficult’. However with modern grating techniques and a better understanding of basic care and growing requirements, these beautiful plants are now finding a place in the garden. The number one factor in growing these plants is sun, they need long periods of good sun every day. They also must have a very free draining soil or potting mix, waterlogged root systems mean fungal problems and decline of the plant. Although these are a drought tolerant plant once established, watering over the first summer is advisable. A light mulch around the plant will also assist in establishment. Fertiliser is a vexed question. In poor soils, a little specialist native plant fertiliser can be used. Over fertilisation can cause problems so use at 1/4 of the recommended rate. 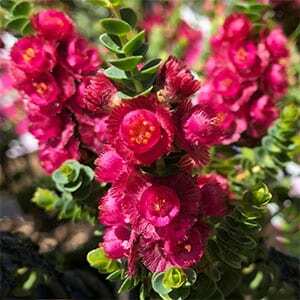 You can prune Verticordia, however we suggest only when its is flowering, or just after. Never prune back into old bare wood, regular tip pruning leaving good foliage in the stem is the best method. Verticordia are available form the following participating nurseries.